simplytheben has no other items for sale. Add all the items you want to purchase to your shopping cart. You then click the Request Total button in the shopping cart to request a new invoice reflecting your shipping discount. Please wait till we adjust your invoice. We will not be able to issue a refund if you paid before we adjust your invoice. THANK-YOU!!! Not sold in Canada any longer. Fantastic item fast shipping!!! Arrived well packed with no damage. As described, thank you. great quality, fast shipping excellent communication! Always fast, always what we asked for... fantastic seller to work with! fast shipping, great shape thank you. 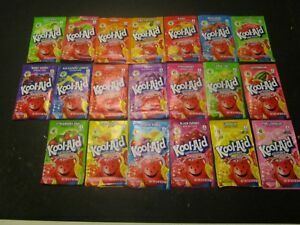 There is not much better than the Exotic Flavors of Kool-Aid! Do yourself and your taste buds a favor and buy some!! Who doesn't like Kool-Aid..........It's my favorite thing to drink!! !